CARSEN CHUBAK is the Elite League’s busiest netminder, but the unflappable Canadian insists he’s relishing the “extra responsibility” since joining Edinburgh Capitals from Belfast Giants this season. Caps face two crunch Gardiner Conference games this weekend, travelling to Dundee Stars tomorrow before taking on Fife Flyers at Murrayfield on Sunday (face-off 5.30pm). 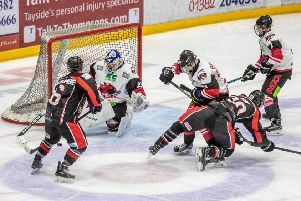 Edinburgh player-coach Riley Emmerson has repeatedly implored his players to offer better protection to his impressive but often overworked goalie as the free-scoring Capitals, who currently sit in a respectable sixth place, have failed to keep the heat off Chubak at the other end. “It can be tough, we’ve been down a couple of bodies so that can make it a little more difficult on our guys.” continued Chubak. “Sometimes, we do a pretty good job of keeping the shots to the outside which is the main thing. It’s a problem when we give up breakaways, two-on-ones, or take too many penalties. So sometimes when I’ve faced a lot of shots, the guys have done a good job, but that’s difficult to notice when you’re looking at statistics. We’ve got a good group here, everybody’s playing hard and we’ve been winning games and that’s the main thing. Edinburgh have beaten Dundee home and away in Challenge Cup action but tomorrow this will be the first time the clubs have met on league business. Edinburgh have not enjoyed the same level of success against oldest rivals Fife, with last week’s 8-3 thrashing in Kirkcaldy still fresh in the memory. “We had battled back really well in the second period to get it back to 3-2 and then conceded a short-handed goal which was demoralising. At the same time, you’re in a game and you never like to quit, but sometimes you can struggle to get things going. Fife are a good team, we wish we could have kept it a little closer but that’s the way it goes sometimes.